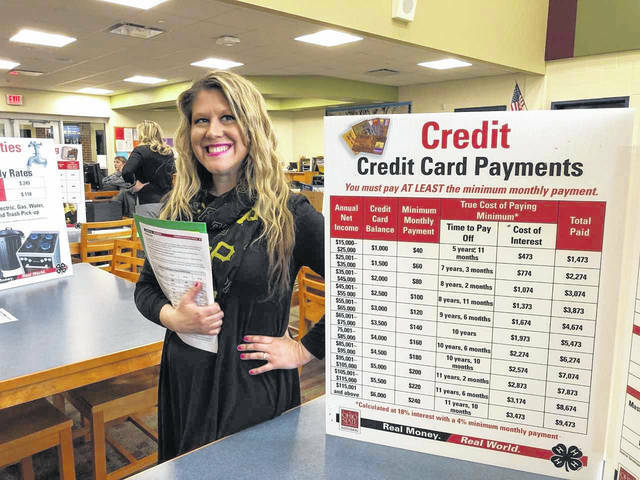 OVB Financial Literacy Leader Hope Roush shows students the value of paying more than the minimum payment when it comes to credit card debt. OVB’s Jackie Hornsby and Jeff Smith share some of their experience when it comes to making financially sound decisions. 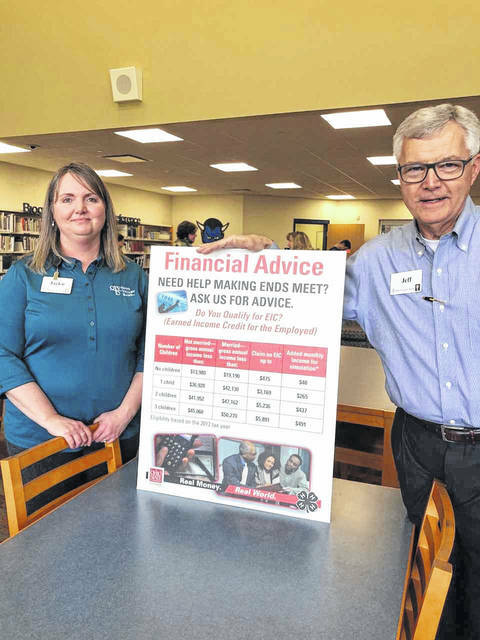 GALLIPOLIS — Financial education is essential when preparing students to become responsible young adults. Through their partnership with the Gallia Academy High School Afterschool Program (ASSET), OVB recently held an interactive budgeting event for participating students. With the help of the Gallia 4-H Extension Office, the event, “Real Money Real World,” taught students the importance of budgeting and money management. “Real Money Real World” is a youth-focused financial literacy program from Ohio State University Extension. According to OSU, the program reaches ages 12-18, but is ideally suited for youth ages 13-16. Using an interactive format, “Real Money Real World” is a spending simulation that provides the opportunity to make lifestyle and budget choices similar to those made by adults. Increase participants’ awareness of how education level and corresponding career choice influence personal income and financial security. Increase participants’ knowledge of money management tools used in daily spending for cost-of-living decisions. Increase participants’ awareness of how income and lifestyle choices affect the amount of money available for discretionary spending. GAHS students achieved the program’s goals as they all finished the simulation with what organizers described as “great success and a better view of how education, income, and family situation can affect our lifestyles.” The different booths students were required to visit included housing, transportation, credit, student loans, food, clothing, entertainment, child care, communications, and financial advice. Students also visited a philanthropy booth that stressed the importance of giving back through means, such as volunteer work. OVB Vice President, Corporate Communications Bryna Butler said she enjoyed volunteering at the event. To schedule a financial education event at your school or group, contact Roush at hdroush@ovbc.com. Information submitted by Ohio Valley Bank.